Qualcomm is pleased to announce that it has started to ship its 10nm Centriq 2400 server processors in commercial quantities. The corporation makes a couple of impressive claims for the Qualcomm Centriq 2400; it is said to be the world’s first 10nm server processor, and the highest performance Arm-based server processor family ever designed. The new processor will be attractive to server makers and users due to its “exceptional throughput performance, performance-per-watt and performance-per-dollar,” reckons Qualcomm. The Qualcomm Centriq 2400 processor is fabricated on Samsung’s 10-nm FinFET process, with 18 billion transistors in an area of under 400mm2. Processors in the family contain up to 48 high-performance, 64-bit, single-thread cores, running at up to 2.3GHhz base / 2.6GHz boost frequencies. Qualcomm says that the cores are connected with a bi-directional segmented ring bus with 250GBps of aggregate bandwidth to avoid performance bottlenecks under full load. A shared L2 cache of 512KB is present for every core pairing, and there is 60MB of unified L3 cache distributed on the die. A Centriq 2400 series processor can support up to 6 channels of DDR4 memory, up to a max of 768GB of total DRAM capacity, with 32 PCIe Gen3 lanes and 6 PCIe controllers. This concentrated muscle consumes under 120 watts. 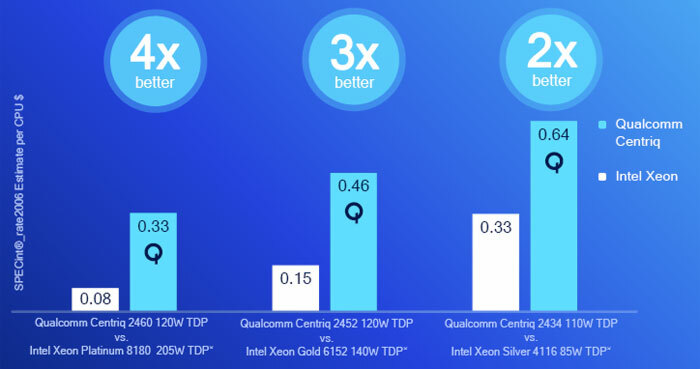 Compared with Intel’s highest-performance Skylake processor, which Qualcomm pegs as the Intel Xeon Platinum 8180, the 48 core Centriq 2460 processor “offers greater than 4X better performance per dollar and up to 45% better performance per watt”, according to the press release and presentation slides. Qualcomm is listing its top end 48 core part at $1995. The data centre silicon industry today is valued around $15-16 billion. By 2020, it’s likely to be worth $20 billion, according to Mercury Research figures. Qualcomm wants to get a hold of some of that double-digit growth with its appealing, competitive designs.